A child's deciduous (baby) teeth are generally whiter than the adult teeth that follow. With age adult teeth often become darker. Discolored teeth cause aesthetic impairment and psychological trauma. 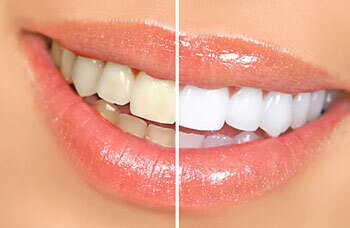 Attempts to whiten teeth as a result of tooth discoloration are myriad and date back centuries. Anything and everything from chewing gum to sophisticated dental restorative treatment has been and is being utilized. Tooth whitening by bleaching is a successful, conservative, relatively inexpensive and safe alternative with few side effects, which for the most part are readily controllable. A third approach, which is a modification of both techniques, can be employed when bleaching vital and non-vital teeth in the same jaw together. This is called “inside/outside” bleaching. This article will address external whitening by bleaching either professionally applied in the dental office or by home whitening techniques. Tooth discoloration may be described as intrinsic, extrinsic or a combination of both. It varies in appearance, cause, severity, position and adherence to the teeth. Intrinsic (internal) tooth discoloration is caused by changes in the structure of enamel or dentine or by incorporation of chromogenic (color generating) material into tooth tissue, either during tooth formation or after eruption. Wear of teeth, thickening of dentin due to aging or as a consequence of pulp inflammation affect the light-transmitting properties of enamel and dentin, resulting in a gradual discoloration. Aging results in changes in the mineral structure of the tooth; the enamel, the outer covering loses its beautiful and youthful translucency, becoming less porous; and the underlying dentin, which forms the body of the teeth thickens and becomes more yellow. Intrinsic discoloration is also caused by exposure to high levels of fluoride, tetracycline antibiotic administration during childhood, inherited developmental disorders and jaundice in childhood. After eruption, tooth decay, restorations, pulp death (root canal problems) and trauma to developing teeth, are the main causes of intrinsic discoloration. Extrinsic staining mainly results from dietary factors and smoking; foods containing tannins such as red wine, coffee and tea can give rise to extrinsic stain. Carotenes, pigments in oranges and carrots, and tobacco use, whether it is smoking or chewing, also give rise to extrinsic stain.